You're looking at a piece of original art by comic book legend ALEX TOTH, for a model sheet from Hanna-Barbera's HERCULOIDS cartoon from 1967. This is a great piece, featuring Toth's classic, graphic style. Pen and ink w/pencil on paper (12 1/2 X 10 inches), excellent condition. See upper right of this listing. 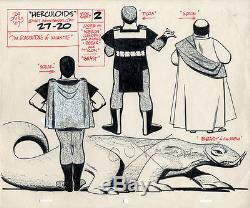 The item "ALEX TOTH Herculiods ORIGINAL MODEL SHEET ART Hanna-Barbera 1967" is in sale since Monday, February 13, 2017. This item is in the category "Collectibles\Comics\Original Comic Art\Other Original Comic Art". The seller is "chesslove" and is located in Jersey City, New Jersey. This item can be shipped worldwide.